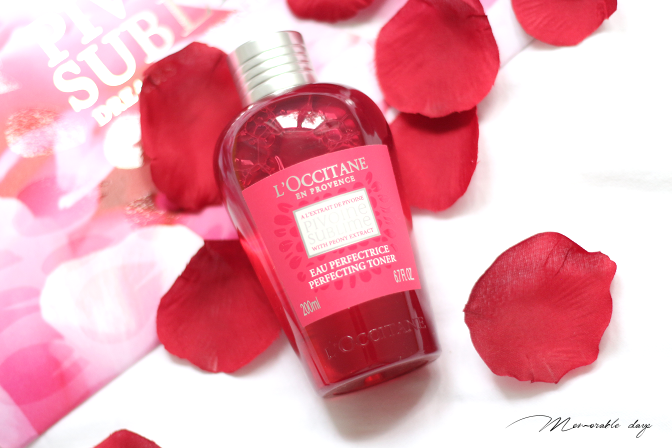 Review: L'Occitane Pivoine Sublime Perfecting Toner | Memorable Days : Beauty Blog - Korean Beauty, European, American Product Reviews. 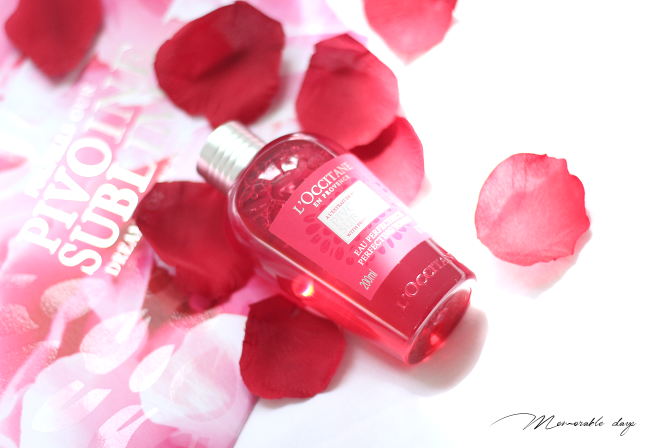 I am sure you have heard of the brand L'Occitane before which is well-known of their lovely hand creams. 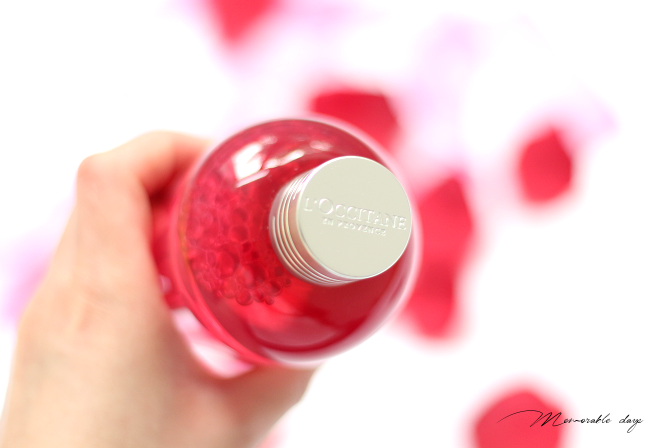 In today's blogpost I am going to review a perfecting toner of the Pivoine Sublime skincare line. This was my first time trying a skincare product from L'Occitane to be honest. Read today's post if you are interested, the packaging is divine! This is the description that it has: this perfecting toner with alcohol completes the cleansing process and helps to moisturise and refresh the skin. Enriched with a skin-perfecting peony extract, it helps to soften and tone, to reveal all the radiance of a perfect-looking complexion. The skin's texture seems smoother, pores appear less visible and you're ready for the next steps in your skincare routine after applying this. 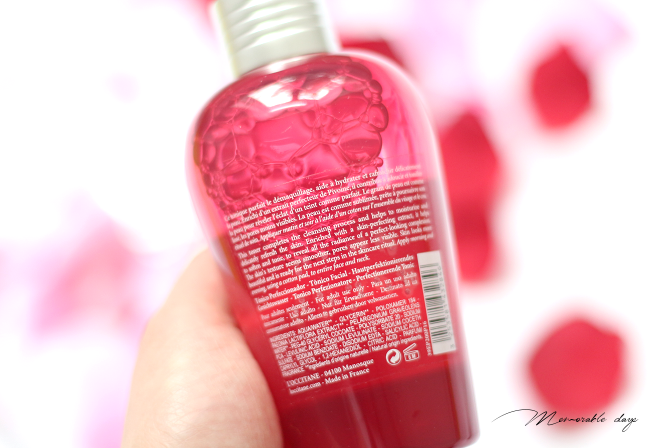 It comes in a beautiful red hard plastic bottle and it contains 200ml of product. 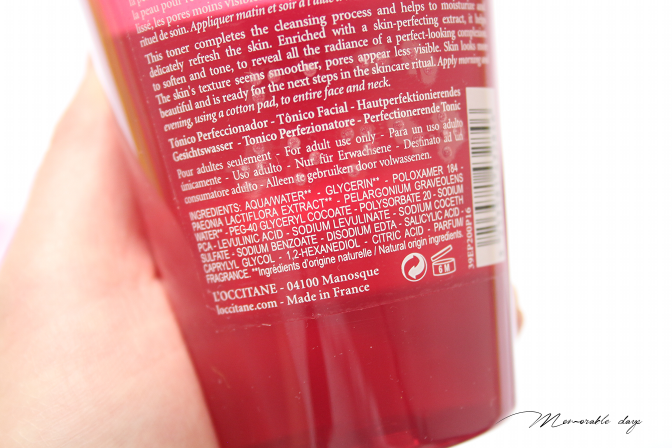 You can see paeonia lactiflora extract (peony extract) one of the first ingredients on the list which means the product contains a high percentage of it. This product also contains acids such as citric acid and salicylic acid (BHA) so it might irritate the skin if you got sensitive skin. The Peony collection has a floral fragrance, it contains peony extract from Drôme in the south of France. I think the scent is pretty strong. It has a runny watery consistency. I simply apply this on a cotton pad every morning and swipe it all over my face to make my skin moist again after cleansing. You are able to purchase it at the local L'occitane stores and on their website at loccitane.com and it's sold for €17.-. - has a floral scent to it (peony), it smells like Spring! lol. First time seeing this I was totally sold by their gorgeous packaging, it's so pretty! Once I opened the bottle, I could already smell the peony scent which is pretty strong. I am normally not a big fan of scented products, and this one was slightly too strong for me at first. However, after I have been using it every morning for a good 2 weeks, I got used to it, so I think it's ok now. Unfortunately I am not blown away by this toner, yes it refreshes and moisturizes my skin which is great, but that's about it. I am not a fan of the sticky feeling after application as well. There are many other toners out here which has more and better effects on my skin, so I wouldn't purchase another bottle of this. If you love peony scent and am searching for a toner to refresh and moisturize the skin after cleansing, this might be for you. If you are looking for more benefits in a toner (like brightening effect/anti-aging) you might want to look further. Please be aware that this toner does contain acids so it might irritate if you have sensitive skin. No irritations occurred on my combination dry skin after usage.